What is a Demo Migration? Demo Migration is a process when we import a small batch of tickets to your target platform and estimate the cost of Full Data Migration. With the free demo, you can test our migration tool before transferring all records, as well as edit and rerun the trial migration as many times as you need. During the Free Demo Migration, our service randomly chooses twenty tickets and transfers them to your target platform along with contacts, comments, attachments and other related records. Depending on the size of the attachments and a couple of other factors, the Demo might take up to five minutes. What to do after the Free Demo is completed? 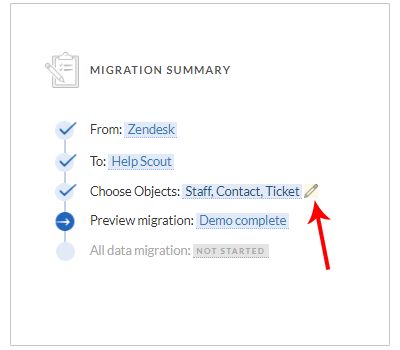 After running the Free Demo Migration, you will be able to review the migrated records in your target help desk. You have to thoroughly check the result to make sure it works for you. Visit this help section to learn how to check the result of the demo for each particular platform. Overall, you should carefully look through each transferred ticket and check if the Type, Source, Status, Priority, Custom Fields, Requester, Agent, Tags migrated correctly. Additionally, if you’re migrating the Knowledge base check the statuses of articles. 1) If you want to rerun your Demo Migration, go back to the previous step, make the necessary changes and rerun the Demo. Please note, that our service will automatically remove the tickets that were migrated previously to avoid duplicates. 2) Once you start the Full Data Migration, our service will also remove the tickets transferred during the Demo to avoid duplicates. 3) You can request a Custom Demo Migration. If you want to transfer specific tickets to check how our service handles them, just drop us a line, specifying the IDs of those tickets. But remember that you can transfer only 20 tickets! Start your Full Data Migration! If you have any other questions about the Demo Migration, feel free to reach out to our support team.